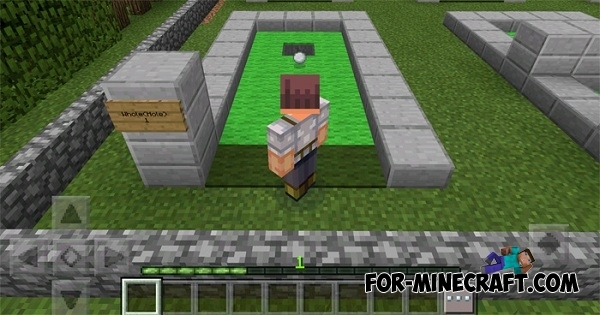 You will find a 13 different golf courses, if you install MineGolf 2 map for Minecraft PE. You can play alone, but you can compete with your friends, then to compare your results and friends. All golf holes are made with varying complexity and each has its own obstacles, so that you will not get bored on this map! To get started you need to take special golf balls from the chests in the shop. Then you have to find the first field and go to the green mark. Now you just have to take a golf ball (snowball) and throw it. If you throw a ball into the goal, then you can add one point in its favor. Notes of your results and share with friends. The map is now installed!